The Science of 350: What You Should Know! 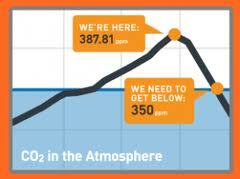 What is the danger level of CO2 in our atmosphere? James Hansen, former NASA employee, is a forerunner in warning the planet of eminent danger. In his article,”Dangerous Climate Change: Required Reduction of Carbon Emissons to Protect Young People, Future Generations and Nature”, published December 2013, along with his Columbia University colleagues, he again warns that the CO2 we are producing today will remain in our atmosphere for a millenia–yes, 1000 years! The Arctic Sea Ice has decreased, along with a decrease in its thickness, melting several hundred cubic kilometers per year and accelerating yearly. Also, mountain glaciers are growing smaller and subtropical climate belts are expanding, contributing to an increase in wildfires. Mr. Hansen states that we need to rethink what a dangerous level of CO2 is in our atmosphere, that the current level of CO2 is at the danger level, which has caused a rise in temperature of approximately 1 degree Celsius in the past 100 years. Sea levels are rising at the rate of 3.2 mm/ per year and cities are already planning to build flood walls to resist the rising seas. In an article, (m.earthobservatory.nasa.gov/Features/WorldOfChange/decadaltemp.php), NASA states, “According to an ongoing temperature analysis conducted by scientists at NASA’s Goddard Institute for space Studies (GISS), the average global temperature on Earth has increased by about 0.8 degrees Celsius since 1880, with two-thirds of the warming occurring since 1995, at a rate of 0.15-0.20C per decade.”…..this is an average over the entire earth’s surface, even though temperatures in a given year or decade might rise 5 degrees in one area and drop several degrees in another area. This data is gathered by NASA from 6,300 meteorological stations around the world, based on land, ships, and satellite data of sea ice. You can download this data at the GISS website. Hansen and NASA both state that if a rise of 0.8 degrees Celsius has produced a rise of sea levels and melting of the Arctic sea ice, then a continued rise of 2 degrees Celsius would will be disastrous to our planet and that fossil fuels should be reduced as soon as possible. Now is the time to act. Our governments need continual pressure to stop supporting the burning of fossil fuels. Questions to ask yourself: How is my electricity generated? Will I care about what happens to the future of my planet? What can I do today? Categories: Climate Change, Fossil Fuels | Tags: #NASA, Climate change, Co2 and Global Warming, James Hansen, Rising of ocean levels | Permalink.